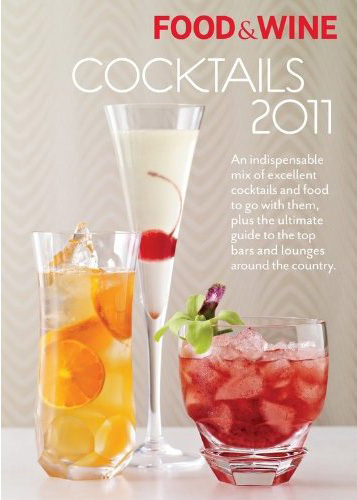 Food & Wine Cocktails 2011 arrived in stores this month, featuring 130-plus cocktail recipes, over 20 party food recipes, a mixology handbook, and a directory of the Top 100 American Bars. After embarking on a global tour with the 2010 edition, Editor Kate Krader brings Cocktails 2011 home with a domestic focus. Deputy Editor Jim Meehan (PDT) scoured the country to compile the recipes, which were tested by Assistant Editor Lindsay Nader, a former PDT bartender now heading the bar at Son of a Gun. In addition to Nader (whose Bargoens Buck is included in the All-Star Mixologist chapter), Los Angeles cocktail culture makes a strong showing throughout Cocktails 2011. The cocktail recipes are once again organized into chapters focused on a particular spirit. John Coltharp (The Tasting Kitchen) heads the Whiskey chapter, dipping into a few recipes from his Seven Grand repertoire as well as more recent creations. Standouts include the Scotch-based August Collins, the Presbyterian’s Aversion (with rye, Averna amaro and ginger syrup), and the Descanso Beach Smash, inspired by a 2008 trip to Catalina Island. The book opens with a “Cocktail Clinic,” which includes how-to’s, a list of Essential Spirits, a glassware and bar tools guide, and new features like the Beginner’s Cocktail Guide and Cocktail Trends (in: salted cocktails, vinegar; out: housemade bitters and meaty drinks). Also new for 2011 is a collection of Chef’s Cocktails, a nod to the increasingly blurry line between chefs and bartenders in high end restaurants. David Lentz (The Hungry Cat Hollywood) and mixologist Jeremy Allen contribute the Four on the Floor, so named for its four equally-proportioned ingredients and the duo’s love of muscle cars. As always, F&W features Party Food recipes to serve with the cocktails. Look for the Sichuan chile-fueled Numb Nuts by Lukshon chef Sang Yoon, and the Creamy Onion Dip from Vinny Dotolo and Jon Shook of Animal. To its credit, Cocktails 2011 travels down the 5 to include a few bars from San Diego: Craft & Commerce, El Dorado and Noble Experiment. On the downside, F&W (like Esquire) neglected to list Seal Beach’s beloved 320 Main. It’s time to start the campaign for 2012 right now, who’s with me?